The Red Sox offense exploded early in support of Chris Sale in beating the Tampa Bay Rays 9-0 Saturday night at Fenway Park. Sale shut the Rays out over six innings for his team-leading 16th win of the year. He scattered six hits and walked one while striking out eight. Andrew Benintendi (pictured) led a 15-hit Boston attack with a double and two singles. He also drove in three runs. Dustin Pedroia put the Red Sox up 2-0 with his seventh home run of the season in the top of the first inning. Mitch Moreland drove in another run with an RBI groundout to make it 3-0. 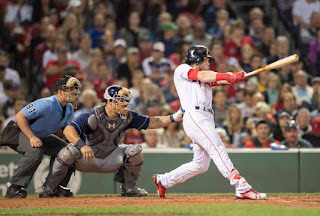 Boston plated five in the bottom of the second on a two-run double by Benintendi, a two-run single by Pedroia, and an Evan Longoria throwing error.